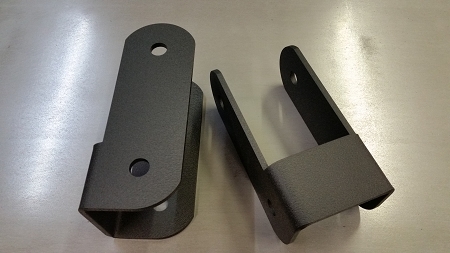 1999-2004 Ford F-250/350 leveling shackles. Customers looking to lift/level the front of your truck 1-1.5", look no further. These will level an F-250. Trucks with a rear block taller than 2.5" will have a slight rake. Ride quality is increased over factory slightly while capacity is maintained. Mounts with factory hardware and retains the use of all other factory components. These are laser cut in-house and built with pride here in the wonderful USA. Finish is a semi gloss wrinkle powder coat. Ordered these to obviously level out my ride. 01 Excursion. Still have a little rake, but running the taller F350 block in the rear. Got the extra height I was looking for and it still drives decent. Would recommend.